“……A previously healthy 47-years-old male developed abruptly malaise, high fever (40°C) and chills only 3 days after walking and sleeping in the countryside of the island of Bornholm (Denmark) during summer season. 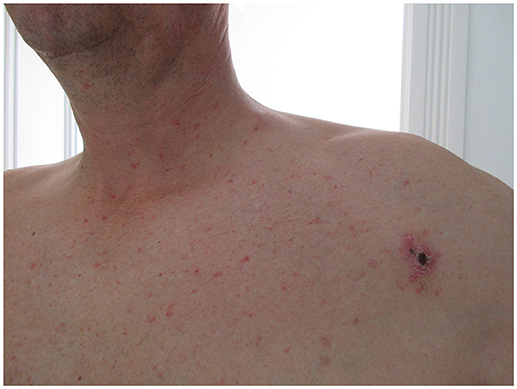 He also reported profuse night sweats, a small left infraclavicular non-painful cutaneous lesion. The patient did not report outdoor activities in the month before and did not recall any tick bite. Three days later the fever vanished and he was first observed in a hospital in Berlin. He was prescribed with amoxicillin/clavulanate 875mg/125mg twice-a-day for 7 days. On the 15th day of disease, he was observed in Portugal because of ongoing malaise. During the observation he did not complain of respiratory symptoms nor headache.